book at Rotherham’s New York Stadium. Rotherham United are struggling to win their matches in the Championship League at the moment, but they still have one of the most fantastic stadiums in the football league. I’m so thrilled they have agreed to invite the Rotherham schools to the launch of my new book on Thursday, March 3rd next year -WORLD BOOK DAY. This book is my scariest book ever! Poor old Zak Freeman, from Scabbajack, is back again. 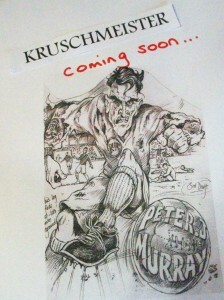 This time to face the most frightening football player of all time…THE KRUSCHMEISTER. We hope all of our fans will have a very happy half-term holiday and a Halloween filled with fun. As I always say in schools during my visits, SCARY should be FUN! And don’t forget, keep on reading, especially later in the day, perhaps when it’s dark outside. Find a quiet corner, pick up one of my spooky books and get that imagination working. And don’t ever look back over your shoulder….just in case one of my scary characters is lurking behind you. 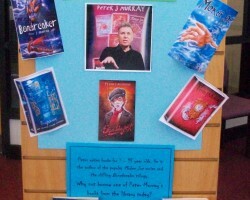 We have just had the most wonderful time visiting three schools in and around my home town of Rotherham. Dronfield Stonelow are old friends and it was brilliant to be back with them again. We did our updated full-blown Mokee Joe presentation in front of all of KS2 and it went down a storm. In the afternoon I ran a workshop with Year 5 and based it on my popular Ten O’ Clock Caller short story collection – most of the pupils had already read it from way back when they were in Year 3! The day passed all too quickly and before we knew it we were back the next day to sign a whole load of books. Since our visit, we have received a great letter from Mrs Collins and her Year 6 group saying how they were taken up with the whole Murray family involvement in what we do. It was a moving letter and I’ve already written a reply thanking them for taking the trouble. Great fans! We will keep on coming back to this ‘brill’ school! 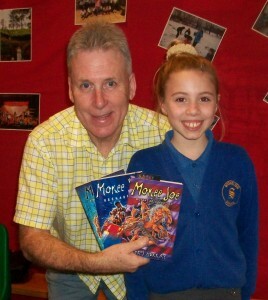 By the way – one of the lovely girl fans at this school had the same hairstyle as I’m thinking of giving Molly in the next Mokee Joe book. She agreed to have her pic taken with me…hope you like it! St Bedes RC Primary up Kimberworth way was our next port of call. This school really is close to our roots. I spent most of my childhood at Kimberworth and my dad went to St Bedes when it was an older and smaller school at Masbrough. Again, we performed our Mokee Joe presentation in front of a big KS2 audience, and again, it went down a storm. We really couldn’t believe how long the book-signing went on for a few days later. All of the pupils without exception were so friendly and polite to us. The short-story workshop was carried out with another great set of pupils…they were so taken up with the seriously spooky Ten O’ Clock Caller story. Thank to all at St. Bedes…we will be back and not leave it quite as long this time. Final visit was to Anston Park Juniors and it was great to link up with our friend, Mrs Bartholomew, who has just taken over as Head there. The hall was packed with fans – around 300 +, and Mr French showed spirit by wearing an ‘electric blue’ jumper…I call it Mokee Joe blue! This audience proved they had the best sense of humour ever and I had to cut down on the jokes in the end to make sure I completed the presentation. Big appreciative audiences mean big book-signings! The next day we ran out of time and we never got to the three Year 3 classes. Never mind – we returned the next morning on the last day before half-term and made sure they all got their books to take away with them. It’s a good job we did return as the Year 3’s were queuing around the hall and buzzing with enthusiasm. Oh well…that’s that and what a way to finish before the half-term break. Have a lovely break everybody and don’t forget to put the clocks back! If you do forget, you might just get a visit from the Ten O’ Clock Caller at eleven o’ clock! First call was to the fab school where I have the honour of being the ‘Patron of Reading’ – Northfield St Nicholas Primary, near Lowestoft in Suffolk. 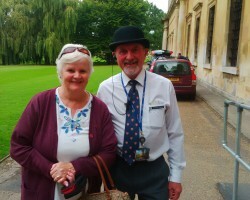 Ms Gulliver, librarian and ‘bezzie mate’, ensured we had two great days organised to her usual high standard. Short story workshops were carried out with all KS2 classes and we even slipped in an Icky Doo Dah presentation for the younger fans in KS1. All in all a great couple of days and the fact that we were staying in our lovely lodge again at the nearby Fritton Country Park added to the occasion. The weather was real ‘Indian Summer’ weather and the couple of hours fishing I managed in the evening provided some great catches. Can’t wait to be back again in June. See you all then. were met by another fab librarian, Lisa Bond, and she looked after us so well from the beginning to the end of our memorable stay. I did a Mokee Joe presentation to around 180 Year 7’s plus a handful of Year 8’s and their enthusiasm and attentiveness was a credit to them. I also did a short-story workshop in the afternoon for two Year 7 classes and again the pupils couldn’t have worked better. A big book-signing the next day earned us real ‘brownie points’ in the eyes of Lisa and the English staff. 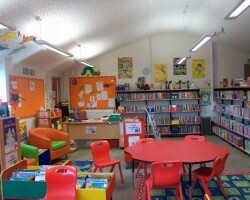 We plan to return to this great school and hopefully build an author-school relationship over the coming years. Thank you to all at St Peter’s for making us so welcome. Kath making friends with a Trinity College porter! Rather than go home and make a long journey back to Luton to visit a school the following Monday, Kath and I decided to have a nostalgic weekend around Cambridge – we lived in Cambridge for one year whilst I studied at Churchill College for my Masters degree. We stayed at the Quiet Waters caravan park in the beautiful village of Hemmingford Abbotts. Our caravan was a BIG change from the Huntingdon Marriott Hotel where we’d stayed for the last two days, but the setting was amazing – right on the banks of the Great Ouse river. More fishing! Yeah! We spent a lovely Saturday strolling around Cambridge re-visiting all the old haunts, including Clare College where we attended the May Ball all those years ago. – but what a great find! Danielle Cacia was assigned to look after us and she did just that! Endless cups of tea, coffee and other refreshments as we set about our job of enthusing lots of Year 5’s and 6’s. 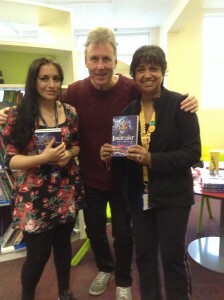 The pupils and staff were an absolute delight to work with and a real bonus was to meet up with our son, Simon, the following day during our book-signing. We’d forgot he’d booked a day himself to work at the school with his Icky Doo Dah art-based workshops. Again, we’re already planning a return visit and hope to build a similar excellent relationship akin to the one we have already with the nearby Beech Hill Primary. A BIG thank you to Danielle and all of the staff and pupils at Denbigh Primary for bringing our two-week tour to such a gratifying end. This post was written by peterjmurray on October 12th, 2015 7:21 pm Comments Off on LOST BLOGS! I can’t believe the last seven blogs have been lost! Such is the mysterious nature of the computer! Apologies to those lovely schools who featured in those blogs. I’m going to re-write the most recent blog entitled ‘TWO FAB WEEKS!’, but the other six most recent blogs may be lost forever!